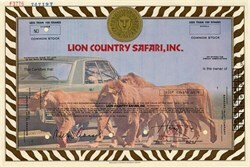 Beautiful Rare Specimen Certificate from Lion Country Safari, Inc printed in the 1970's. This historic document was printed by Security-Columbian Bank Note Company and has an ornate border around it with a vignette of a lion's head a group of lions cruising with the traffic passing the reserve. This item has the printed signatures of the Company's Chairman, Harry Schuster and Secretary and is over 27 years old. Lion Country Safari was founded in 1967 by a group of South African and British entrepreneurs who wished to provide a safari experience for families who would not normally be able to experience it. The park originally exhibited only lions. The first park in South Florida is currently believed to be the only Lion Country Safari. At one time there were parks in California, Texas, Georgia and Ohio. An amusement park in Richmond, Virginia called Kings Dominion (now Paramount's Kings Dominion) opened in 1975 with a similar attraction called Lion Country Safari. Another drive-through zoo known as Lion Country Safari existed in Irvine, California on the site of the current theme park Wild Rivers which was converted from Lion Country's entertainment area in 1986-87 after the LC park closure in 1984. The remaining portion of the park was converted to a Day Camp (the drive through reserve was used for horseback riding, archery, ATC, ATV riding and hiking) for children named Camp Frasier (Owned by Lion Country's parent company United Leisure) U.L. was headed up by CEO, Harry Schuster (South African Founder of L.C.). 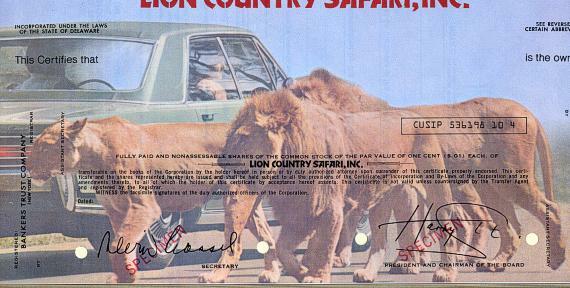 The Lion Country Safari Park in Irvine was originally in the city limits of Laguna Hills and opened in June of 1970. It was the Second Lion Country Safari (After Florida). However in 1982 a long bitter battle began between Schuster and the Irvine company where the Irvine company decided to renegotiate the 28 year lease on the land which began in 1968 and try to take back control when property values increased. Harry Schuster then became involved in a bitter and excruciating legal battle with the Real Estate monster until 1997 when they finally reached a compromise. During this ongoing legal battle Schuster threatened to 'tear it all down' including: Irvine Meadows (built on a sublease agreement with U.L. )- Now Verizon Amphitheatre, Wild Rivers, and the Day camp he founded. His reasoning was, "I built all this on a firm contract, why should The Irvine Company be allowed to take it from me just because they want it back?". As of May 2006, the Irvine company still hasn't done anything with the land except re-grade what was once the Drive-Through-Reserve and sublet portions for Nurseries to store plants. Harry Schuster also founded the 'Loves' restaurant chain.